Recently, the Uttar Pradesh Real Estate Regulatory Authority (UP-RERA) found out that quite a few developers and promoters are misusing the funds of their escrow accounts. Wasting no time, the housing regulatory body wrote a letter requesting banks to be alert and keep a strict watchful eye on such accounts. Letters have been sent by speed post to the zonal heads of 42 banks. In addition, UP-RERA has also forwarded the letter to the director general of the Directorate of Institutional Finance, UP government. Banks will have to see to it that the provisions of Section-4 (2) (I) (D) of RERA Act, 2016 are complied. According to it, 70 percent of the amount for a real estate project is to be deposited in a separate account and to be maintained in a scheduled bank to cover the cost of construction and the land cost. This particular amount can only be used in very rare circumstances. UP-RERA Chairman Rajive Kumar confirmed the news. “It has come to the notice of the Authority that some of the promoters are not complying with the statutory provisions of the law and withdrawing the amount from the designated account without submitting the requisite certificate. This is a grave violation of the mandatory provisions of the Act,” Rajive said. According to UP-RERA Secretary Abrar Ahmed, escrow accounts for 2,651 projects registered under RERA are being maintained in 962 branches. A few of these are located outside UP. Abrar further added that all 962 branches have been sent letters via speed post. 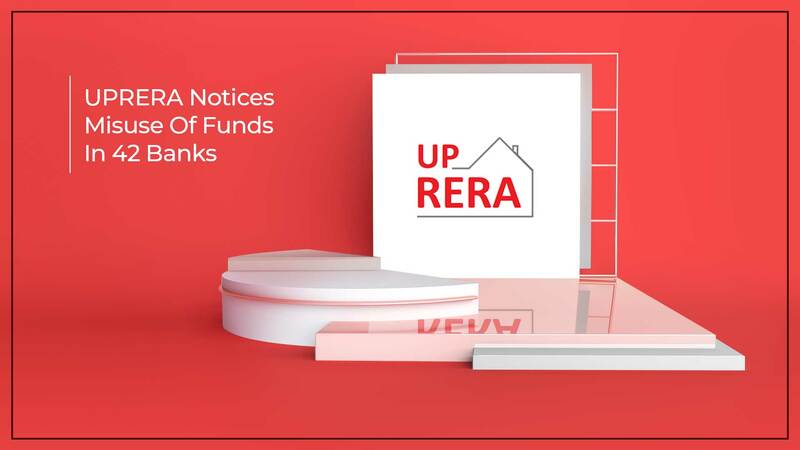 UP-RERA also noticed that there are a few banks, especially the ones that green-light the loan to the promoters, unjustly adjust the entire amount deposited in the account against the outstanding loan of the promoter instead of transferring 70 percent of the money collected to the escrow account. The banks here are at fault and have been given a strict warning via their regional managers, deputy general managers, assistant general managers and branch managers to stop this malpractice and follow the rules. If UP-RERA notices in the near future that its warning was not paid any heed, the authority will forward its findings to the chairman of the respective banks and the secretary of the banking department of the Government of India so that strict action can be taken against the perpetrators. Out of the 42 scheduled commercial banks, 21 fall under the public sector and the remaining are private sector ones. An escrow account is a temporary pass through account held by a third party during the process of a transaction between two parties. This is not a permanent account. It is only functional till the transaction process has finished. Once everything between the buyer and the seller is settled, the account is closed.